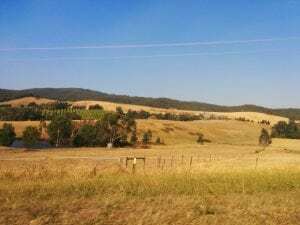 Spotlight On The Yarra Valley - Australian Wine Tour Co. Located a mere 50 kilometres from Melbourne’s CBD, the Yarra Valley is a picturesque region characterised by sprawling vineyards, rolling hills and some of the best wine and food Australia has to offer. The Yarra Valley is also a popular destination for tourists and locals alike, which is hardly surprising given its rich viticultural history and the essential role the region has played in terms of food production, tourism and wine exports since the early 1800s. Did you know that the Yarra River, which stretches through the Yarra Valley is known as ‘Birrarung’ (place of mists and shadows) to the Indigenous Wurundjeri people? The first vines were planted in the Yarra Valley in 1838, but the art of viticulture in the region didn’t really start to leave a mark until the 1860s and 1870s. However, due to increasing demand for fortified wine, the Yarra Valley was forced to cease its wine production in 1921 and in 1937 the Great Depression and adverse natural conditions saw vineyards being converted into pasture. Did you know that the Yarra Valley was Victoria’s first wine growing district, with a history stretching back 180-years? Thankfully, this dry spell wasn’t permanent as the 1960s saw viticulture spark up again in the region with the early 90s marking the true high point of Victoria’s 19th-century wine production. Flash forward to the present, and the Yarra Valley’s long timeline of events has hit an all time high with the region now being home to more than eighty vineyards that each contribute to the region’s international reputation for first-class wine. 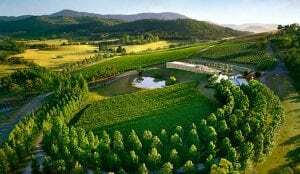 Renowned for producing world-class cool-climate wines, the Yarra Valley is known for its production of Chardonnay and Pinot Noir, which makes up roughly 60 per cent of the region’s total production. However, you’ll never be hard-pressed to find a Cabernet Sauvignon or a Shiraz. The Yarra Valley’s Chardonnay is widely regarded as its premium grape variety and across the region, a new, lighter in weight and less oaky style has emerged. When it comes to the Sauvignon Blancs produced in the area, they tend to have a roundness and fruit generosity that sets them apart from the flavours often associated with New Zealand’s South Island. The flavours produced in Victoria include fresh tropical fruit, guava and cape gooseberry. On a trip to Victoria’s Yarra Valley, you’ll also find Pinot Gris/Pinot Grigio, Marsanne, Roussanne and Viognier (but only in small amounts), as well as Rosé and Sparkling Wine. Did you know that spring in the Yarra Valley sees more rain than winter does? The vineyards in the Yarra Valley aren’t the only attractions worth noting, as this picturesque corner of Victoria’s south-east is also home to Healesville Sanctuary, where you can get up-close to Australian native wildlife, as well as the Yarra Valley Dairy and Yarra Valley Choclaterie and Ice Creamery. You’ll also find that the area has plenty of bed and breakfasts to stay in, day spas that give a new meaning to the words relaxation and pampering, and of course, fantastic day tours that show you the best of the Yarra Valley in a short amount of time. Did you know that the Yarra Valley is flanked by the Great Dividing Range to the north and east, the Dandenong Ranges to the south and the Plenty Ranges to the west? It’s literally sitting in the middle of some of Victoria’s most popular areas. If you’re ready to explore the Yarra Valley, but would like an expert guide to take you on the journey of a lifetime, book a full or two-day coach tour Australian Wine Tour Co today!